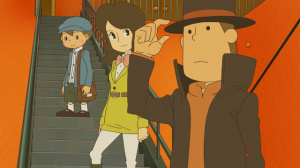 During the 3DS-only Nintendo Direct broadcast back in April this year, the company announced that it was planning to bring the final chapter in the Professor Layton series, Professor Layton and the Azran Legacy, to the handheld later this year. Today's Nintendo Direct presentation revealed that the final piece of the puzzle will be solved on the 8th November, which sees the gentleman himself and his trustworthy companions Luke and Emmy embark on an adventure to solve the riddles of the Azran civilisation. It won't be the last time we see Hershel Layton though, as he'll be joining Capcom's lawyer, Phoenix Wright, in 2014 as Professor Layton vs. Ace Attorney was also confirmed for localisation for the Western market. A launch date for Professor Layton and the Azran Legacy hasn't been mentioned for North America, but it's still aiming for a 2014 release. Will you pick up the concluding addition to the much loved series? Or will it be too hard to say goodbye to it? Let us know in the comment section below. I'm going to get this game for sure! Wow, so many good games going to be released! ^Dual Destinies isn't the same game as Ace Attorney VS Layton. Besides that, even though they're saying it's the "final" game in the layton series, they said that after the first trilogy too. I'll believe it when it happens. I wonder why the U.S. must wait until 2014 for this Layton title? Odd seeing as Reggie, Iwata, etc. all say that they are starting to shoot for simultaneous worldwide releases. Whoops... Misfired on that one eh, Nintendo? This is gonna be a hard one to wait for. It only serves to stoke my hatred of region locking. @Zach777 That's because Layton is published by Level-5 not Nintendo. We need this game for Wii U! Aaahh yes... But how does that explain Mario and Luigi: Dream Team then?